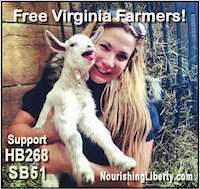 Virginians have fought back the NGO environmentalist assaults on their land, private property rights, and the right to farm by introducing HB 1430, The Right to Farm Act, better known as the Boneta Bill, which passed the House of Delegates 77-22 in February 2013 but was blocked by the Senate Agricultural Committee by a vote of 11-4. The sponsor of the bill, Delegate Scott Lingamfelter, promised to reintroduce the bill in 2014. The Resolution called on the Republican Party of Virginia “to support state legislation and local ordinances consistent with each farmer’s right to determine what best constitutes farming, farm life, the best uses of his/her own farm land, respect for their neighbors,” market pay for their labor, and to repeal state laws and ordinances inconsistent with the Resolution. Martha Boneta found herself at the center of the battle for farm freedom and property rights when she held a birthday party for eight 10-year old girls at her Paris Barns. Fauquier County deemed this party illegal because it lacked permit. “Why would I need a permit for pumpkin carving?” Boneta said. Boneta was issued a special license in 2011 which allowed her to run a “retail farm shop” in which she sold handspun yarns, fresh vegetables, eggs, herbs, honey, and craft items such as birdhouses. Fauquier County Board of Supervisors changed in 2011 the “farm sales classification” to require a special permit for activities that were previously included in the permit that Boneta had already been issued. Farmers engage primarily in agriculture; additionally, they have the right to commerce, the right of enjoyment of their land, assembly on their own property, the right to exercise religious freedom on their lands, the right to grow, eat, sell their locally produced foods without burdensome local and state government regulations or dictates from environmental groups sponsored by international groups and entities with taxpayer dollars. Government should not use laws, regulations, zoning ordinances, or cumbersome and expensive permits to violate or trespass on farmers’ rights and freedom to farm under the guise that they know what is best for farming in general or one farmer in particular. Such government agencies that violate farmers’ rights and trespass on their property should be made accountable for their deeds. Americans should not be treated as guilty until proven innocent while giving environmental groups unlimited power without much redress for small farmers who do not have the means to fight back and must shut down their farming operations and farm stores as was the case of Martha Boneta in Virginia and many others across the country. The new Governor of Virginia and the General Assembly have a duty to advance legislation in 2014 that respects the rights of citizens to pursue their self-interests as protected by the Constitution of the United States and of the Commonwealth of Virginia.